I have a lot of very frustrated patients who say to me that they would do almost anything to finally lose weight and get their hormone problems under control. In these conversations, I know what’s coming next: A long list of the things they’ve tried that didn’t work. Many of these women have also decided that most drugs and hormone supplements are a dead end. They may work for a time, but you will ultimately be left in worse condition that when you began. They are looking for an entirely new approach, with the most important thing being that it must actually WORK! Why haven’t the things you tried so far actually worked (or continued to work)? It seems like there must be some unknown stress factor that prevents normal, sensible diet, exercise and therapies from being effective. There IS a reason for this: a stress factor that affects your hormone and immune system that you almost certainly don’t know about. In my experience, this stress from very specific environmental toxins is a factor or a primary cause in most women with hormone problems. It sounds like a conspiracy theory, except that the EPA, FDA and NIH all agree with me on this one. As you will see, this can be a very big deal. If you have hormone, weight, immune or emotional problems, it’s very important to your chances of recovery that you get fully informed on counterfeit hormones (technically called Endocrine Disrupting Chemicals). 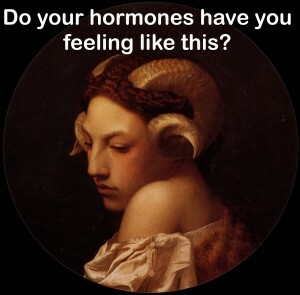 You need to know about counterfeit hormones to understand your condition and why you have trouble recovering from it. You also must know how to avoid continuing exposure to these substances. Finally, you need to know about any techniques that could be effective to help your body recover from the effects of these toxins.